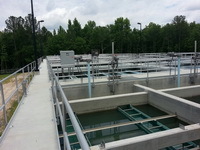 The water treatment plant is a new 4.7 MGD plant located in Burnettown, SC. 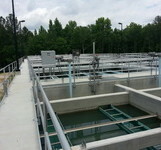 The project included conventional sedimentation and dual media filters. ZEL designed a unique clearwell with integral contact structure and integral high service pump station that included 300 HP finished pumps and 100 HP backwash pumps. The raw water source is from Clearwater Lake and is pretreated using potassium permanganate for organic loading, caustic for pH adjustment, alum for coagulant, and a polymer for a flocc aid. The finished water is treated with caustic for pH adjustment and sodium hypochlorite for disinfection. In addition to the design, ZEL completed a PER for DHEC, PER for Rural Development, NPDES permit, DHEC construction and operations permit, Environmental Assessment required by Rural Development, and water withdrawal permitting.